April has been a "meh" month for me, sewing-wise. I had such exciting plans! But I can't quite seem to motivate myself to work on them. I started swim suits for the kids, but then it rained and I got stuck, realized I had to unpick some seams, and put them aside. Since then, I've had a bad case of "WIP-itis" - you know, where you avoid sewing because you feel guilty about an unfinished project? Ugh. It's lame. And I'm still there, stuck in a bit of a sewing rut, still avoiding those darn suits! Super lame! Anyway, a couple weekends ago, it got pretty hot - April in Oakland is generally really beautiful, one of my favorite months in the year, weather-wise - and it became pretty apparent that my kids are lacking in warm-weather clothing. Both of them have grown a lot in the last year, especially Joe. Meanwhile, the lovely Rachel at Stitched Together sent me a piece of this gorgeous Evelyckan Design Fairytale Hummingbird fabric with Maggie in mind a couple weeks ago. Sewing friends are TOTALLY the best! Maggie and I literally "squeed" when we saw this fabric! I thought perhaps one way to address my sewing funk would be to whip up some fast and easy items - palate cleansers, so to speak. 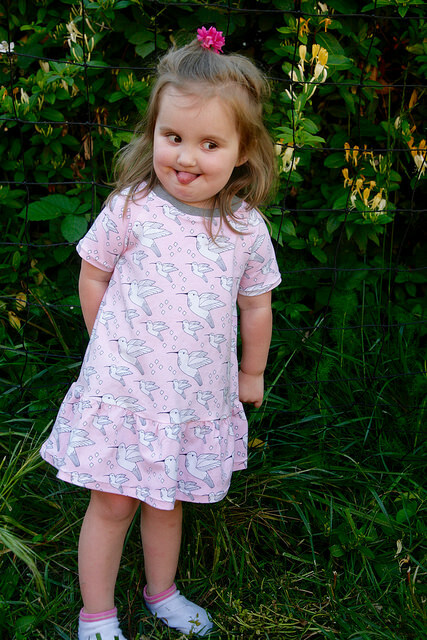 I started out with a vision for the hummingbird fabric - I wanted a simple knit dress with a drop waist for Maggie. I looked through my Ottobres and considered several different options, including an Oliver + S Sailboat Top hack, but most of them required more fabric than I had. Ultimately, I settled on a a really simple option - a Safari Raglan with a gathered skirt. 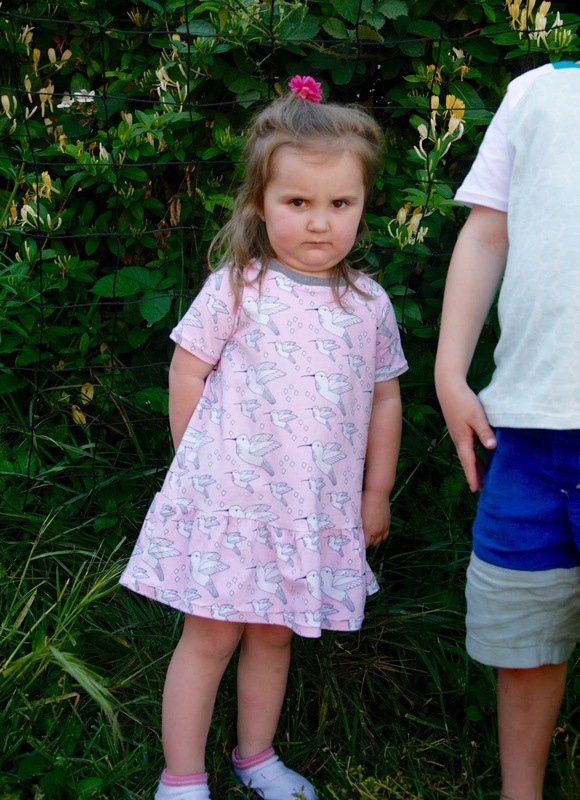 I tested the Safari Raglan Dress for Titchy Threads about a year ago, and the pattern has sat in my stash since. This time I cut the dress in size 2 with short sleeves for Maggie, and used the fabric I had leftover from cutting out the dress to cut a narrow rectangle for the skirt. The dress has a little bit of an a-line shape, and I liked the way that looked with the gathered skirt attached. I finished the neckline with heather gray bamboo ribbing from Stonemountain - a self-finished neckline would not have worked in this not-that-stretchy cotton jersey. Unfortunately, the kids were SERIOUSLY not in the mood for a photo shoot! Ha! There was a lot of refusing to look at the camera while making funny faces! Well, the dress turned out cute! The fabric is GORGEOUS, people. So pretty. I feel like the photos do not do it justice (well, especially with Maggie refusing to look at the camera and/or making silly faces). This was a really simple sew, with only one minor hiccup. The first time I made it, I felt like the skirt was attached too low and the dress looked like a nightgown, so I cut the ruffle off at the seam allowance, shortened the dress a bit more, and sewed it back on. Now the dress is definitely on the short side - almost tunic length - but the proportions look better. Maggie likes to wear shorts or leggings under her dresses most days anyway. "So, Maggie, are you having fun?" For the first time ever, I used the "ruffle" function on my serger to gather the skirt. This was especially convenient because I wasn't trying to gather a specific size rectangle into the width of the skirt. I ruffled a width of fabric piece, and then pinned it to the skirt and cut off the excess. It was really simple, and it gathers about 2x, which is perfect for this style of skirt (but you might like a more gathered look for other kids of skirts). All of my hems and the neckbands were done with the double needle on these items - hopefully the hems will hold up! With the Safari Raglan pattern out, I decided to try it out in Joe's size. Although the Oliver + S Field Trip raglan has been my go-to for the past couple of years, I thought it would be fun to have another pattern to compare it to. 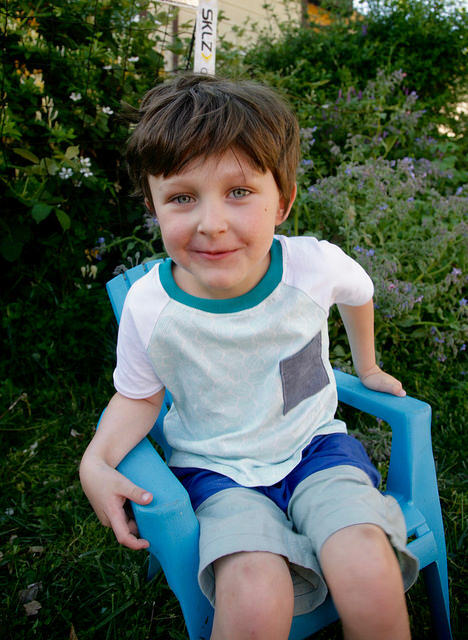 I used this really nice Cloud 9 organic cotton jersey in pale blue that I bought from Imagine Gnats a while back (also used in this project) for the body of the shirt. Light blue is Joe's color, big time - it makes his eyes really "pop"! Thankfully, blue is one of his favorite colors too, and he loves geometric prints, so when I see fabrics in light or medium blues, I grab them. The sleeves are plain white (I believe the white is a Laguna knit) and I used more of my favorite bamboo ribbing for the neckline, this time in aqua. Joe told me that he likes shirts with pockets. Not necessarily to hold things in, but "to help me figure out which way is the front." I don't usually put tags on my hand sewn t-shirts and I notice that Joe often puts his plainer t-shirts on the wrong way. A front pocket helps him know which way is which! That is functional design, huh? The Safari Raglan has a pattern piece for a front pocket and it can be cut out in either a knit or a woven fabric. I decided to make the pocket from a plain chambray I had in the stash. I thought the different blues looked nice together. Because the pocket was in a woven fabric, I could use straight stitch to top stitch it, which reduces the "wobble" factor of sewing two knit fabrics together. The shirt is a size 6 with a little extra length. Joe is long in the torso, so that is a standard modification for me. I would say that the fit of the Safari is a bit slimmer and longer in the body than the Field Trip raglan. But otherwise, yeah, they are pretty similar! Let's be honest, you probably don't need BOTH in your pattern stash, but the Safari Raglan does have some fun options (a dress for girls, long sleeves and puppet cuffs). 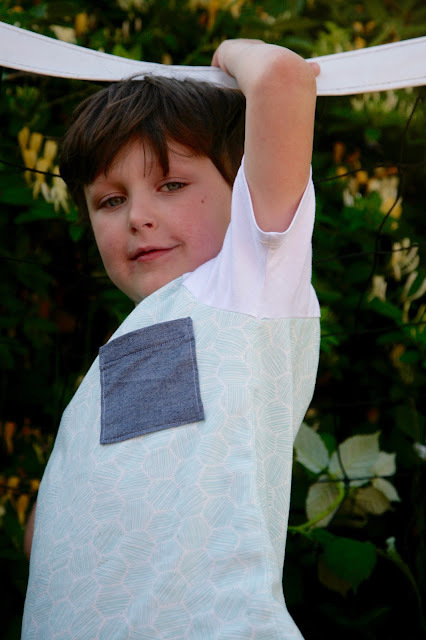 Either pattern will get a major workout if you like to sew basics for your kids. Speaking of patterns that get a workout, Joe is wearing some color-blocked Sketchbook shorts that I made him last year. At the time, they had tons of extra length, but now they are one of the few pairs of shorts in his bins that hits him at his knees instead of way above! This boy is growing! I definitely need to make this guy some more shorts as well. Sheesh. What did I tell you? Worst photo shoot ever. They were just not having it! After I made these two raglans, I actually turned around and whipped up a couple of Rowan Tees for Joe as well, using thrifted shirts. 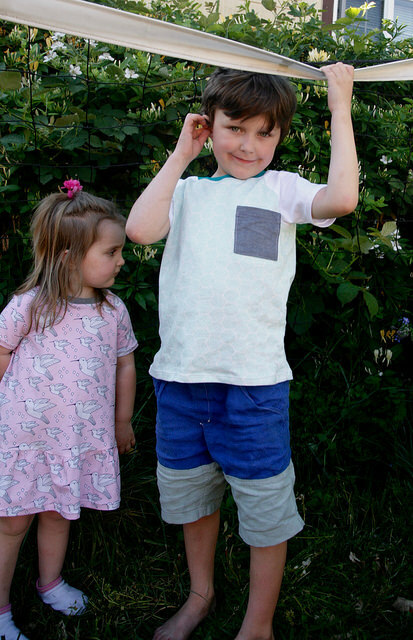 Titchy Thread t-shirts are quickly becoming my TNT kid's t-shirts. Joe has already worn them both to school, but I haven't gotten photos of those yet. Soon, hopefully! I always feel really virtuous when I can put a dent in my knit scraps and thrifted shirts to upcycle, so this was a good run for me. I find that once I get the double needle set-up, I really might as well whip up more than one knit item, because they go so fast once you have the equipment ready to go. Alas, I wish I could say this t-shirt spree did the trick and broke me out of my sewing funk, but it didn't really. This last weekend, I spent a few minutes finishing the last of the Rowan shirts, and then avoided my sewing area for the rest of the weekend. Ugh! I know I just need to get in there, unpick those serger seams, and finish those damn swimsuits, in order to get out from under this WIP-cloud-of-blah, but somehow I just can't seem to motivate. No bueno!! How do you break out of a sewing rut? Help! Ha ha- I like their funny faces ;-) That hummingbird fabric is just adorable and I like the mix of fabrics you used for Joe's t-shirt. Hmm- missing sewjo is a struggle. Got any TNT patterns you could sew for yourself? Does your fabric and/or pattern stash need reorganizing? Stuff those WIPs in a drawer and sew something that inspires you! (That's what I do, anyway). Maggie's dress is beautiful, and the length looks great. I find that ruffled skirts have to be above the knee to avoid looking nightgownish. And Joe's top looks great, too - that geometric print is really nice. Maggie's face in the second picture is hy.ster.i.cal. Adorable tees, all, and that hummingbird fabric is lovely (I also really like how the gray ribbing sets it off). Good to know about the serger gathering function, too - I have never used it because I couldn't work out how I was supposed to get my strip of fabric to gather to a particular width - next time I need to gather something and have extra fabric I might just try cutting my piece long and doing it this way. I hate gathering stuff. Also, have been there with the WIP-itis. I always find that once I finally pull out whatever needs unpicking, it goes much faster than I think it will ... but finding the motivation to do so is a killer. Agree with Meg, go sew something for yourself! I love the kids expressions, they're hilarious! I say just get stuck into the stalled project and you're not allowed to start anything until you're done. At least, that's how I role and then she the boring/pesty project is over you csn enjoy something nice with no guilt. Now, I have some very ugly dressing gowns and slippers to get back to. Oh, and super cute dress and t-shirt! I have been in a bit of a sewing funk myself. I have been struggling lately with insomnia- I kind of always have had trouble falling asleep. But I no longer get on my computer or sew in the evening because I know if I do, I'll be up until 1 or 2 am for sure and I have learned to have more respect for tomorrow. :P It's not a lot of fun homeschooling and running a household with 5 children when one's exhausted. It feels like there has been a collective slow down in the sewing-blogging world, doesn't it? 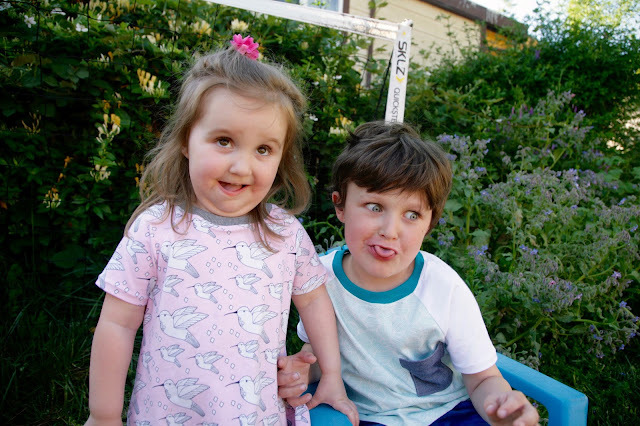 I love your kids silly faces! I truly don't know how people get decent photos of kids at this age. As soon as they see the camera come out they start acting like goofballs. The raglans both look great! You are so right about blue making Joe's eyes pop. And I agree that you move on to something fun to help get your sewing motivation back! Maybe then you'll feel like tackling those swimsuits again.